After months of speculation regarding SoftBank’s proposed takeover of Deutsche Telekom’s controlling stake in T-Mobile, it seems those rumors can be laid to rest. At least for a short while. A report by Bloomberg states that DT’s CEO, Tim Hoettges told company directors yesterday that a sale of its US carrier is unlikely to happen in the near future due to “regulatory hurdles”. In recent times we’ve heard plenty of reports that SoftBank’s CEO, Masayoshi Son has met with regulators to try and sound out the possibility of a merger with Sprint. He believes firmly that if the smaller carriers are going to challenge the “big two”, that regulatory bodies need to allow consolidation. Sadly – for him – the Department of Justice wasn’t keen on the idea, and neither was the FCC. This lack of support from those in charge also supposedly lead to a recent plea by Son with the chamber of commerce, trying to garner support from the public. This doesn’t mean that Deutsche Telekom isn’t looking to sell, however. Bloomberg‘s anonymous sources who have “direct knowledge of the matter” indicated that DT would still like to offload its 67% controlling stake in the company, and that SoftBank is its preferred option. There are other options, one of which is to dispose of the some of the shares after a lockup expires in November. But with that option carrying a financial disadvantage, it’s not likely DT will take that route. On a much more positive note, Hoettges told the supivisory board that he’s taking a much more long-term view at the U.S. market. Prime focus is keeping hold of the customers who recently joined T-Mobile’s subscriber base, and shifting prepaid account holders on to monthly subscription accounts. He also argued that if a merger with Sprint (or another carrier) isn’t possible, then T-Mobile should at least be given the opportunity to acquire a competitive amount of available spectrum at the upcoming auctions. All in all, it’s almost 2 silver linings on one cloud. We’ve known for a couple of years that DT doesn’t want to keep hold of T-Mobile US forever. 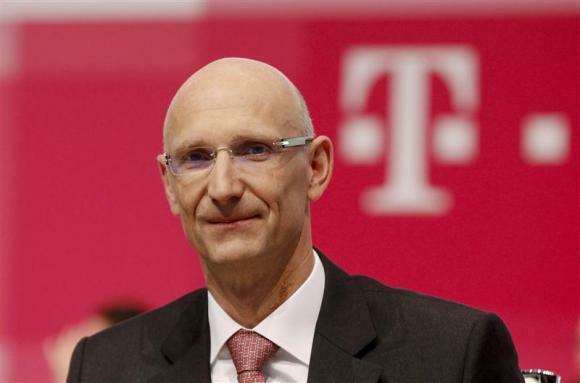 But, the fact that a merger isn’t likely any time soon and the fact that the new Deutsche Telekom CEO wants to help make Tmo more successful is a refreshingly positive piece of news. If SoftBank had bought T-Mobile instead of Sprint, I don’t think there would be any talk of them then trying to buy Sprint. I think SoftBank realizes that they screwed up. T-Mobile was the backup. Son went after Sprint because of 2.5Ghz TD-LTE that Softbank uses in Japan. Frankly it would have been better if DISH bought Sprint, and Softbank got T-Mobile. I thought that the reason for the 2.5G matchup was to get better deals from handset makers due to volume. However, one of the arguments being put forth for tmobile was again, to get better deals with handset makers. It is confusing because it seems unlikely they will move everyone from tmobile over to sprint network. Clearly, Son is having handset issues in the US market. And not the only problem. The only viable option if they did it, would be if Softbank literally reversed the buyout, not keeping Sprints network and pushing as much spectrum into T-Mobile and it’s expansion and keeping John on as T-Mobile CEO. They’d minimize the customer hemorrhaging that way. They’d would migrate over users like they’ve done with MetroPCS, not actually MERGE networks like they tried for years with Nextel. As they shed customers off of the old, terribly slow, Sprint Network, they could refarm the freed up spectrum to T-Mobile.. focus on expansion and beefing up T-Mobile’s backhaul even more..
Issue. Their Spectrum holdings really do not match .. it’s a very bad matchup. T-Mobile has much better backhaul in most areas, better engineers (see speed of LTE rollout) and partnerships when it comes to their rollouts. Really.. Softbank should have held out, waited, and bought T-Mobile, not Sprint. ROFL! I’m betting Son is kicking himself right now..
Softbank wants mostly the T-Mobile hardware ie it’s network, but also the customer base and spectrum. The customer base would give it leverage when it comes to phone makers. The Tmo network will allow Sprint to have an almost immediate access to towers with upgraded backhaul and technology. Crap! This means the deal is imminent. Hey, the executives could be telling the truth for once. I mean, they’ can’t be PURE evil, right? The difference between now and 2011 is that back then we didn’t know what the FCC and DoJ response would be. If you haven’t done so already, take a look at the DoJ submission back in 2011 which effectively killed the AT&T deal. Substitute Softbank/Sprint in place of AT&T throughout and the document hardly needs any other changes. Add the fact that both institutions have indicated their position won’t change and there us very little point in Softbank proceeding right now. While it’s possible that TM is putting up a smoke screen, it seems much more likely that he’s being honest right now. Actions speak louder. The co. has outlined coverage expansion that will continue this year and next (without any additional low band spectrum- any addition there would be gravy). They have also started these “presentations” to financial institutions, a clear indication IMO of raising further debt. They surely have further investment in mind ( could be for spectrum bidding). They recently bought spectrum from verizon- why would they ? I think that J.L. and his team are hell bent on building this co, fully aware that it may be sold eventually. As the building process makes further progress, sellout will be less likely. Company is generating positive cash flow, even after the capex. Why would T-mobile deploy their 4G network right before attempting to be bought by AT&T. They knew months and months before deployment that they were planning on selling. This is no different. this is good news for the time being hopefully sumthing good comes about this im just happy that tmobile isnt going anywhere. time to save up for that spectrum auction and work up on the coverage. I think one of the arguments that we haven’t heard from FCC is they will not leave USA with only just three carriers, because … its USA and every small country around the world has at least 3.On a side note: Why Softbank didn’t bid for T-mobile in a first place, instead they purchased Sprint?! !.Even a small research on Google can give a ton of information to a potential buyer from out of the country to AVOID purchasing Sprint. Why i am not a CEO.I like how good John Legree and his stuff are in the marketing.And if i have learn how this guy thinks , then i think all the blackberry drama from few days ago, has been very well planned in advance.Just make me think T-mobile is very good in that.After all only they can give me what i need and that is indeed – unlimited high speed internet. So I guess this was why TMUS stock dropped like a knife 5mins before close today, but mostly rebounded. Didn’t see the news at the time. How about a little historical perspective regarding DT’s statements about not selling T-Mobile? We can trust this Tim Hoettges guy, right? Yes, historical perspective is important. So, that basically changes this article to confirming that the deal is in the final stages… It’s over. I read this article and thought never trust a politician who says he/she will not run for a higher office and never trust a CEO who says that he/she won’t sell the company. Very true that previous actions can undermine current statements. History repeats itself. Hoettges was part of the At&t purchase attempt but working from DT’s side. I suspect he made the first statement when At&t “may” not have agreed to the selling price DT was asking. This prompted him to say the company was not for sale as the private discussions went sour. Then came a revised offer from At&t that hit the magic sweet spot with the $$$. My speculation of course since we don’t know what was going on behind the doors. He also saw first hand the destruction it did to T-Mobile USA. Hoettges has expressed previously no desire in seeing that happen again. It will cost a pretty penny to repair the momentum and image of the company for a second time. Forget using that money from a break up fee to buy spectrum right away as they will need it to stay open for business and do damage control. This concept of him wanting to hold on to it longer is also not new. It was in January that he stated being fine with waiting for the right buyer and time to sell even though it would take longer. Hoettges may have the patience and no desire for a quick sale that the previous CEO didn’t have. The previous CEO would have also made the final decision to sell to At&t 3wks after Hoettges’s comment if they revised the offer. That last part about the company given the chance to be competitive in getting spectrum is promising. I don’t think the previous CEO would have been willing to say that. Would that mean money from DT to help in the purchase or raising it another way, time will tell but it is more support from the parent company than what was previously given. you don’t really expect a CFO to come out and yes we’re for sale while in the middle of high stakes negotiations now do you? idk, a successful American company buying a failing carrier is much different than a Japanese company buying a German telecom’s portion of a publicly traded American company and rolling it into their failing American operation. You know I never liked the idea of Sprint buying T-Mobile. T-Mobile made it on their own, well sorta. They did it with very little money they got from at&t and good marketing. Sprint could learn from T-Mobile. I can now sleep better knowing my Kitkat Note 3 and T-Mobile are safe from the failing Sprint. Why does DT hate T-Mobile USA? John Legere took this joke of a company and reinvented it. DT should be jumping for joy. I wonder if T-Mobile USA could break away from DT an go on it own? DT doesn’t hate their US branch. They have invested a lot of money into the company. They are now having financial/network issues in their home European markets that need addressing. T-Mobile USA is profitable and was before the At&t deal but they were losing customers then and all the talk about not having a 4g plan was B.S.. The money they will gain from selling it far exceeds the money they could get yearly by keeping the company. That cash infusion from the sale is what they want and need to pay off debt and help fix those company markets in Europe. DT has had no interest to invest more money in the company while they try to fix and upgrade their networks in Europe. This lead the US branch to suffer with limited money to do upgrades. If I remember correctly DT took the cash from the At&t attempt, or most of it, and left T-Mobile to deploy the gained spectrum. They did drop the billions needed for T-Mobile US to purchase high frequency spectrum in a gov. sale that happened before the important low frequency sale that saw Verizon and At&t sweep up most licenses. DT just didn’t have the billions needed again so soon to hand the US operations. So I don’t think it’s a hate they feel but more of a opportunity to sell an asset at a time when previously they couldn’t do much to advance it. Now that the company has done a 180 turn, DT can wait and doesn’t need the first buyer that steps up. The new CEO may decide in the end to keep the company since he isn’t the one hell bent to sell like the previous guy. He seems willing to see how it shapes up. Thank you for the insights. Most of us in the U.S. aren’t all that aquanted with the going on’s of the European market. It seems like they been mismanaging a lot of their operations for a long time. Son will meet in Washington on the 11th to try and gather support for combining the TMUS and Sprint to make the Countries biggest Carrier. Dish network will be the third carrier and the Game plays on. It’s going to boil down to the 600mhz auctions for T-Mobile. If they can get a nationwide slice of it, then they’ll have the capability of building out nationwide high-speed data that would make their coverage comparable to the big 2. If they don’t get it, then there is only so broad they will be able to expand their LTE footprint and in turn a limit to how many customers they will be able to obtain. So we will see what happens these next couple of years. *if* there will be a 600Mhz auction. That is not set in stone, and the transition for that spectrum has a 10 year schedule right now, not including potential interference issues and/or lack of participation by broadcasters. I echo some of the comments here. What does DT have against T-Mobile USA? Does DT lose money with T-Mobile? Especially over the last year, T-Mobile is the hottest brand and it is actually kind of cool to have T-MObile now. Yes, the coverage isn’t as widespread as AT&T and Verizon, but Sprint is not the answer for that. With the 700 MHz block becoming usable towards the end of the year, I think a lot of people will have great coverage. After years of mismanagement and poor strategy DT’s European wireless operations are in the gutter so they want to ditch T-Mobile and use that money to improve things before everything really turns to sh*t.
Mod edit: Removed link to Financial Times as it requires a registration to read the article. Why can’t we be able to read the article without a stupid Dell ad blocking the text and being unmovable? Easy let the page finish loading and then scroll all you want. BOOM!!! Read. I worry about another reverse merger possibility. Okay, just for discussion: If somehow T-Mobile sales goes to SoftBank, just saying, who would you “jump” to? That would leave Verizon, AT&T, and some smaller prepay outfits which use the big 4 networks already.